The client asked us to create a campaign that 1. centered around the rich and remarkable history of Blanton's and how that history has shaped their product and made it one of the most sought after bourbons on the market. 2. Stands out from the average "bourbon style" ad. 1. Connect with their prime target market, men, ages 40+ by showing scenes of history that Blanton's fought through and prevailed. We wanted to connect with them on an emotional level by showing them scenes that some might remember or remember their parents telling them about. We also wanted to challenge them to fight for things in their life that are worth fighting for. 2. We took the bourbon style ad and twisted it to make it unique. We wanted to show how the history is as much of the company as the bourbon itself. This was the most difficult aspect of conceptualizing and how it would look. So we came up with the concept of history bottled and turned these scenes of history into the bourbon itself. 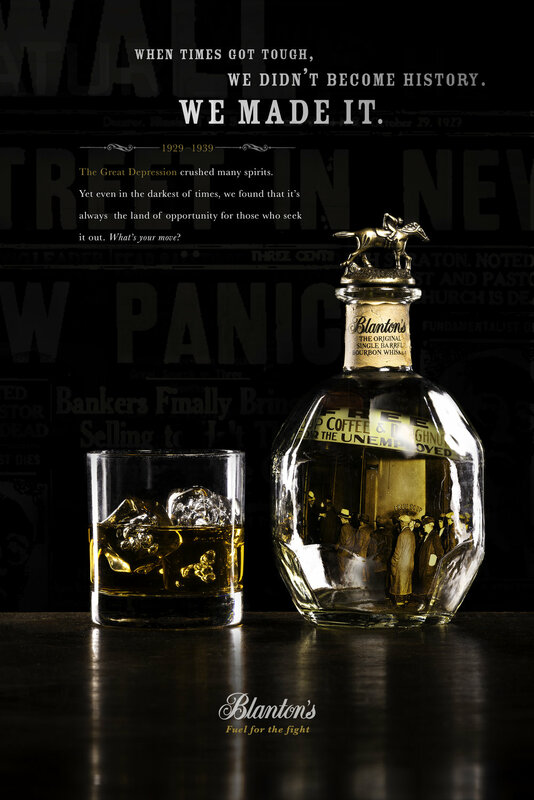 We wanted the consumer to feel like every time you pour a glass of blanton's, you're pouring a glass of history. we kept some aspects of the typical bourbon ad, I. E the dark background, high contrast, and light type but decided that a plain background was too typical so we imposed newspaper articles to be the background. The ads are laid out to move the viewers eye from the type, to the bourbon, and finally, to the logo.